It’s just after 2:00 a.m. when you head home from hanging out with friends in downtown Nashville. You’ve had a couple of beers but you feel alert and capable of driving home safely. Then it happens. Blue lights begin flashing in your rear-view mirror and you find yourself being pulled over for suspected DUI. The Law Office of Bernie McEvoy offers these six tips if you’ve been suspected of driving under the influence. Find a safe place to pull over while using your turn signals. Once a police officer decides to pull you over for suspected drunk driving (DUI/DWI), they’re already making observations that will go into the police report. The report can have a significant impact on the outcome of both your criminal trial and your DMV hearing. The officer is making a mental note of how you pull over, which is why you should use proper signals. If you are driving erratically, slow down too quickly or pull over in an unsafe location, these things will be included in the police report. Do not make any sudden movements. Police officers are trained to be cautious, and to protect themselves first. Stay in the car and keep your hands on the steering wheel as the officer approaches the car. The most obvious reason to treat the officer with respect is that you are far less likely to be arrested. You should not be rude or hostile in any way towards the officer. Offer a polite and courteous greeting when the officer approaches. Do not answer any potentially incriminating questions. Refusal of a field sobriety test or hand-held breathalyzer. You are under no legal obligation to perform a field sobriety test or a roadside breathalyzer. However, you should take the test if you’re certain that you will register under the legal limit of 0.08 percent. In the state of Tennessee the legal limit is lowered for commercial drivers to 0.04 percent and 0.02 percent for drivers under the age of 21, which includes driving under the influence of controlled substances such as amphetamines, inhalants, marijuana, and other intoxicants. There’s no set formula drivers can follow to know when they reach the legal limit, it will vary per each person based on gender, weight, and number of drinks. If you think that you might register over the legal limit, then you should refuse the test to avoid a DUI conviction and not incriminate yourself. If you decide to refuse the test, you will be in violation of the implied consent law and will be charged. This is not a criminal charge, therefore you cannot be fined or jailed but you will be subjected to a 1-year license revocation. 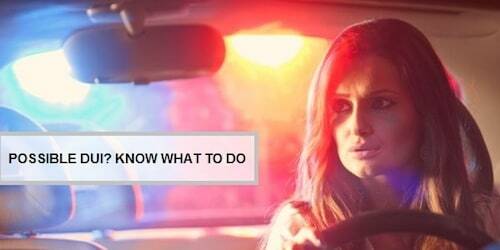 If you or someone you know has been arrested and charged with a DUI offense in the Nashville, TN or Davidson County area, contact attorney Bernie McEvoy, an experienced, passionate and dedicated DUI attorney ready to handle your case. Schedule a free consultation by calling (615) 255-9595 today.